That’s right this book is by Harlequin, maker of romance novels. What of it? I’m secure. 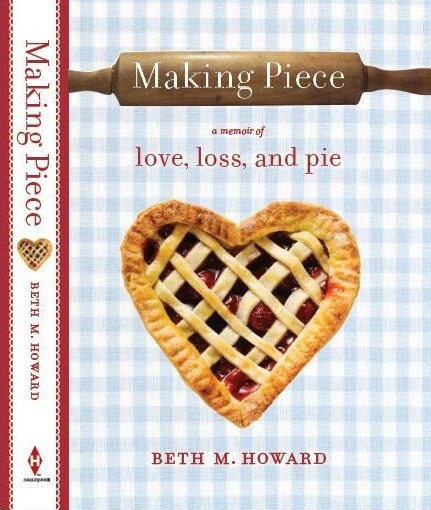 “Making Piece” is a memoir of a difficult time for author, Beth Howard. She was married to a man who in her eyes was obsessed with work. They at times lived in separate states (her in Texas, him in Oregon) and separate countries (her U.S and him Germany). The long work hours and long distance relationship made it difficult to retain a spark. They had discussed getting a divorce when her husband suddenly died at the age of 43. This was the event that led her to reassess what she wanted to do with her life and what made her happy. Her conclusion? Make pie. Pie, specifically banana cream pie is one of the ways her Mom charmed her father into marriage. The same was true of her and her late husband. Many of the happy occasions of her life were based around it. After her husband’s passing she travels across the country trying pie and making pies – some for the purpose of a TV pilot, other times to just bring people together. (Kind of a dream life huh?) Eventually she returns to the place of her roots in Eldon, Iowa where she starts a Pitchfork Pie Stand at the American Gothic house. It’s an entertaining, fast read of a book. Occasionally I found myself losing interest in her story (piemaker to the stars!) and the constant pie metaphors. Luckily the book is peppered with fun stories about judging pie contests, how her mom made her dad banana cream pie when they first met. The best story of all comes at the end in which she charms her way into living at and selling pie in the American Gothic House. There is no way to escape wanting to make pie and I’d credit this book for my first pie making endeavor, posted here. It’s not a bad book though yours truly is probably not the intended audience. The back of the book contains a half dozen recipes from pie makers she meets through her journey. If Oprah’s Book Club existed, this book would probably be a selection. It’s a feel-good type of story for those who understand food as a means of healing.